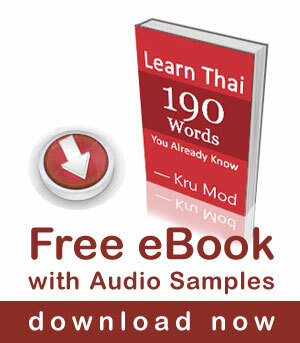 Kanom Krok is Thai sweet and savory dessert commonly found on streetside throughout Thailand. 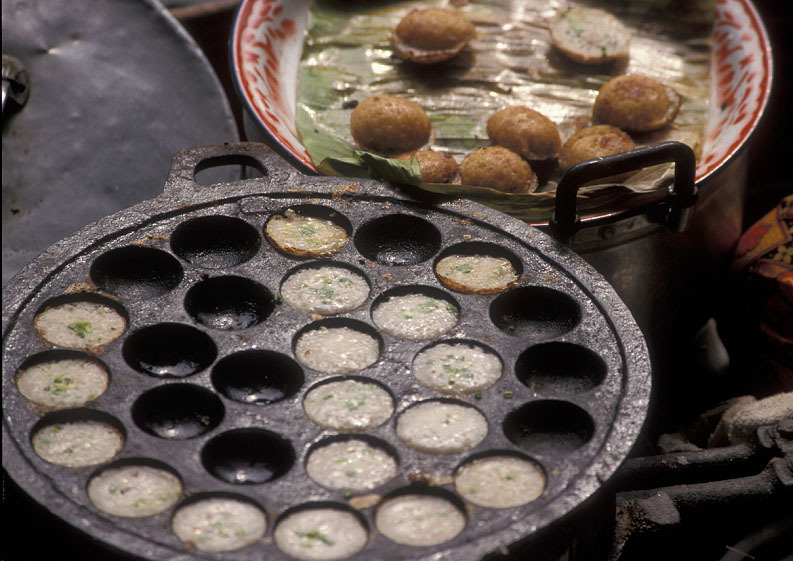 Kanom Krok is prepared in a cast iron pan with small round indents in it (กระทะขนมครก gra-ta kanom krok). Usually the pan is placed directly over charcoal in a round clay oven. 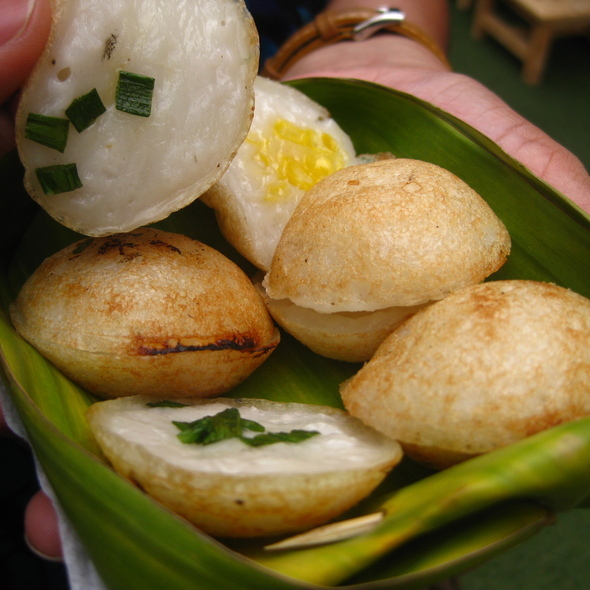 Kanom krok has two layers; bottom layer and the topping. When the first rice flour mix is cooked, then the sweet coconut milk topping will follow. After the cakes are cooked, the hemispheres are usually placed on top of each other to make little spheres. Long time ago in a village, there was a man named Gati (in Thai means ‘coconut cream’), he fell in love with the most beautiful girl of the village named Pang (in Thai means ‘flour’) who was the only daughter of the village headman. They met on Loy Kratong Day, and made a promise in front of the moon that they will love each other forever despite any barrier. Gati was working hard to save money for getting married to his girl, but the father rejected him because of his poverty. One day he was hurt by a group of men sent by the village headman, but it didn’t make him give up for his love. He was willing to go back to negotiate with the father until he approved. Unfortunately, the village headman made his daughter married a deputy from Bangkok. Gati heard about this bad news and he was going to stop the wedding. The night before the wedding day, Pang found out about his father’s evil plan that he made a trapping pit on the way from Gati’s home to Pang’s premises to hurt him, so she sneaked out of her house to let him know. It was a dark night and Gati was on his way to see Pang as well. They saw each other from far away, with so much joy Pang ran to Gati and fell in to the pit. Gati jumped in there trying to help her. The village headmand’ lackies saw only Gati falling in the pit, they buried him right away. The next morning, the village headman dig the ground wanting to see that his plan was successful, but what he saw was Gati and Pang died in each other arms. The villagers knew about this sad news, to remember Pang and Gati’s love they made Thai dessert that were made of coconut cream and flour and cooked in cast iron pan with small round indents in it. Then putting one on top of the another making a whole as a symbol of two of them will be together forever. They named this sweet ขนมแห่งความรัก Kanom Haeng Kwaam Rak meaning Dessert of Love, or ขนมคนรักกัน Kanom Kon Rak Gan and later it is called in short ขนม ค-ร-ก Kanom Krok (ครก in Thai is read KROK). Sad story for very lovely dessert. Anyway, have you tried Kanom Krok before? I have tasted Kranom krok in one of the Bangkok streets last October and I find it good tasting. Actually Im trying to find in the net where I can buy the kranom krok pan so I can make the pudding in my country, Philippines. I found 3 sites in the net but they are in the US. They dont ship to the Phils. Though their kanom krok is imported from Thailand. Is there a way you can link me to a seller/retailer in your country? We too in Southern India cook at home ‘Kanom Krok” which is called ‘Ney Appam’ in the Tamil language. Butter oil (Ney) is the medium used and the batter is made of the mixture of rice and raw sugar (jaggery). There are occasions to cook this snack. The full moon day of the month Kritika (Nov 15-Dec 15) is one such day. Sisters light lamps at homes for the welfare of their brothers and cook this snack. Incidentally, we celebrated it on 17 Nov (yesterday). Thanks Mod, I mentioned Kanom Krok to my girlfriend and one day later she made it for me :-). It tastes great! Thats a sweet story for a sweet ขนม, my favorite snack.